“Cervical radiculopathy” is the medical term for a “pinched nerve in the neck.” The nerves that control movement and sensation in the arms arise from the cervical spinal cord which is located in the neck. The spinal cord is surrounded and protected by the bony spine. The spine is composed of the vertebrae and their bony projections. 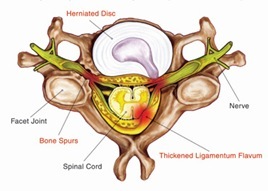 Between every two vertebrae is a “disc” which acts to absorb compressive forces on the spinal column. 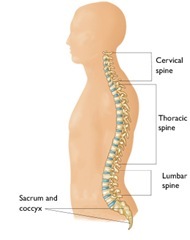 The spinal cord lies runs behind the column of vertebrae and is surrounded by the bony spinal column. In the neck area, the spine is called the cervical spine. The individual nerves that supply the arms leave the spinal cord and exit through small openings (see photos). A pinched nerve in the neck can lead to pain, numbness and weakness of the arm. The location of the pain, numbness and/or weakness will depend on which cervical nerve is involved. Treatment of cervical radiculopathy begins conservatively with nonsteroidal anti-inflammatory drugs such as ibuprofen (Motrin) and physical therapy. Physical therapy may include gentle cervical traction. The goal is to relieve irritation of the nerve root. 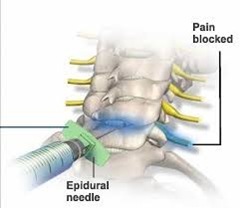 If the condition is unresponsive to this conservative treatment and a cervical disc herniation is suspected, the next course of action is often a trial of cervical epidural steroid injections. This procedure involves injecting corticosteroid medication into the space just outside of the outer membrane of the spinal cord near the location of the affected nerve. The purpose is to bathe the irritated nerve root with powerful anti-inflammatory medication. Surgery is always a last resort. A decompressive discectomy involves the surgical removal of any disc material pressing against the cervical nerve. Best pain doctor in NYC, Dr. Matthew Grimm, can be contacted for more information at: 646-862-5555. What Is a Decompressive Discectomy? ← What is cervical myofasciitis?